From my youngest days, I knew I loved boats and being out on the water, but both of my parents disliked boating. I always felt like a duck out of water. Wherever we vacationed as a youngster, Mom and Dad tried to make sure I got a boat ride of some kind, either in Northern Michigan or South Florida. For me, boating meant a short spin in a Chris Craft or Century mahogany inboard speedboat, an Alumacraft boat with a 10HP outboard, or an old rowboat or canoe. In the fall of 1959, I entered Dartmouth College, on the Connecticut River dividing New Hampshire and Vermont, and immediately pursued my dream of becoming an oarsman on the college crew. A rowing alumnus in Boston had just given the school a gift of a new 1959 Boston Whaler Sport 13, complete with a 25HP Evinrude engine. Many now have forgotten what a revolutionary and strange looking little craft this was in those days. In 1959 wrap-around windshields and tail fins were big on the autos of the day, and the outboard fiberglass boat industry was desperately scrambling to make their little 16-foot runabouts look like those cars, complete with tail fins! There was even a Cadillac boat company. The other major influence in outboard powered boats of those days was the famous Lyman or Thompson wooden lapstrake hull, with varnished mahogany interior, windshield, sit down steering, and a rounded interior floor. It was considered very dangerous to stand up in a boat like those, particularly while underway. And even worse, the boats of those days sank readily; foam floatation was unknown. The Whaler 13 and 16 were soon to make those old wood round bottom boats obsolete. The new Whaler was destined to be used as a coaching launch, where the coach would be able to cruise along side the crew shells, which can move about 20 MPH with eight men pulling the oars, and do his coaching with his cheerleader style, non-electrified, megaphone. Within a couple of weeks, everybody fell in love with this odd looking boat. Boats weren't supposed to have a level floor where you could stand up while underway, hold on to rails and yell at your students through the megaphone; they weren't supposed to be so laterally stable, and be so quick with such a little wake. And they were supposed to sink! For four years of rowing, fall and spring each year, we watched that little Whaler out of the corner of our eyes, marveling at what a cool and great looking little boat it was. The coaching staff loved it. Only once, with our coach so totally comfortable with standing in the boat, did the student pilot give it too much acceleration and toss the coach right into the drink! I knew I had to have one some day. Five years later, now out of Grad school and in my first real job in 1968 in Albany, New York, it didn't take me long to discover Lake George. My wife and I went up, rented an aluminium boat for a day, and saw Whaler hulls all over the place, including the Lake George Park Commission 16' Nausets. Even my non-boating parents were now raving about the Whaler. They had been invited on a friend's 42-foot Hatteras for a cruise from Ft. Lauderdale over to Bimini in 1966, and the owner towed his 13-foot Whaler tender on the crossing. The seas were evidently running over 10 feet, and the Whaler would disappear behind the large boat on every wave, only to repeatedly show up on top of the next wave as it followed behind. I guess it was quite a sight, and Mom and Dad said that Whaler never missed a beat! They also had a great time bopping around in the Whaler when they got there. Now was the time, we decided, to get that Whaler. Hull No. 110 in the Adirondaks (1970). The 10-year warranty was already off the hull, and Mercury in those days only made a 35 or 50HP engine, so I went for the 4 cylinder 50 Merc, itself another classic that stayed in production until 1996. The boat handled the extra power like a charm, and it would blow the doors off the usual 13' Whaler power of the day, the old 2-banger OMC 40's. 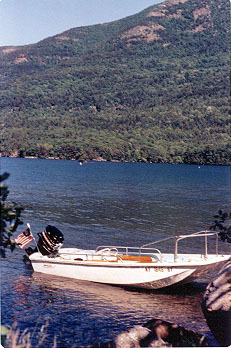 For three years, my wife and I, both approaching 30 and no kids yet, tooled around in that little Whaler wherever we took it, which included trailering it all over the Adirondacks, running out to Martha's Vineyard in 4' seas, and down to the Florida Keys, generally becoming addicted to "Boston Whalering". The Wm. Mills Co. forward shelter, tan color canvas in those days, extended the season from early April ice-out to late November fall days, kept gear dry and us out of the wind. I have never seen another 13 (or 15) with that option, but it would be as valuable today as it was back then. We were now completely hooked on Whaler, and could only dream of our next one, which would be a new 16' Nauset, in the spring of 1971. That's another story, but I've owned nothing but a Whaler ever since. We reluctantly sold our 13 for $1300 in the spring of '71, three years after I had bought it. I had put about that same amount of money into it, so I figured the boat had treated me well. But I wish I still had it! It seems the dealer had sold the Sport 13 three years earlier for use as a tender and life boat aboard a large sport fisherman out of Ft. Lauderdale. Typically, these Whalers sit in a cradle on the large, flat bow section of this type of craft, with a hoist to lower them into the water. It never struck me as an optimal place to have to launch a lifeboat if the going got rough, but then again most of these are carried for use as a status symbol and as a fair weather tender for island and harbor hopping. Nobody ever seems to really believe that such a boat could save your life. Anyway, on this particular day, this Sport fisherman evidently ran into some nasty, high seas conditions crossing the Gulf Stream from Bimini back to Lauderdale. Add to that the loss of one of their diesels, and the captain decided that they should get Whaler in the water, and under tow in case it was needed while limping back in. But getting the Whaler safely off that pitching foredeck, and down over the side proved to be difficult, and the Whaler broke lose, sliding off the deck and into the sea, landing upside down. Recapturing this overturned boat in 12-foot seas, with only one engine was evidently not possible, and the boat had to be abandoned as it drifted away from the yacht, 25 miles offshore. Approximately a year later, May of 1989, a pleasure boater fishing off Bermuda, discovers a 13-foot Boston Whaler, floating upside down with engine still attached, and tows it to harbor, fearing a drowning at sea. There are a lot of 13-foot Whalers in Bermuda. Authorities there had no reports of missing persons at sea, and incredulously, finally traced the hull number back to south Florida. So our yacht owner gets a call saying they have found his abandoned Whaler in Bermuda.! This boat drifted for a year, upside down, and carried by the Gulf Stream, all the way from Fort Lauderdale to Bermuda in the open ocean, and survived in restorable condition!! The Owner had it air cargoed back to the dealership, and they were going to clean it up and re-outfit it for future use. My guess is that it's still running around the waters of South Florida to this day. Copyright © 1999 by James W. Hebert. All rights reserved.